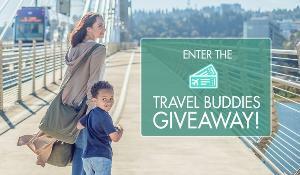 Prize: $500 Southwest Airlines Gift Card; WAYB Pico Travel Car Seat; Packable Yellow Leaf Hammock (portable); Looptworks Packable Sling Bag; Yumi Organic Baby Food Delivery ($75 credit) (Total ARV: $2,800). What you must do to enter: complete form. Note: the rules are from a past contest -- this contest expires on 11/11.